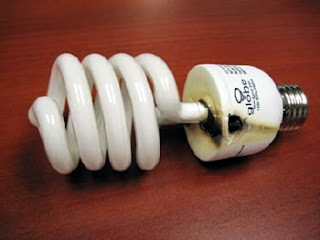 I too have have a CFL burn out and look just like the one in the above picture. It was very hot and smelled like a rectifier when it burns out. I'm a Ham Radio operator and electronic technician so I've seen and smelled many rectifiers burn out. The burn out occured within a couple minutes after turn the light on. I replaced it with an incadesent bulb for my safety.